Gina Martin collected 111,098 signatures and spent 18 months fighting to make upskirting illegal in the UK – a nation where only 15 out of 44 police forces held records on offences related to upskirting at all. Like the HEROES I’ve chosen previously for #FeministFactFriday (Everyday Sexism Founder Laura Bates; WPP Country Manager Karen Blackett; Salesforce CEO Marc Benioff) Gina Martin is an incredible example of what you can achieve when you fight for a cause. Martin’s story has been in the national press a lot since she started her campaign, but I hope you’ll forgive me for re-telling the story here, via various sources such as Stylist and the BBC. Martin was waiting to watch The Killers perform at the British Summer Time music festival in Hyde Park when a man put his phone between her legs and took pictures of her crotch. She managed to grab his phone and run over to police with the proof, but though they were supportive they were unable to do anything about it because upskirting wasn’t a crime at that time. A few days later she posted a status update on Facebook detailing her experience. Her post went viral, with other women sharing similar experiences. She started a petition to change the law ‘we want the law to specify clearly that this is a sexual offence with a victim, by adding this offence to the Sexual Offences Act 2003’ and secured 111k signatures by the time the petition closed on the “Petition Site“. This was an uphill battle, taking 18 months, and facing opposition in Parliament, but Martin had her supporters and allies who helped to make sure that her work was a success. These included Ryan Whelan, a lawyer at Gibson Dunn and MP Lucy Frazer. 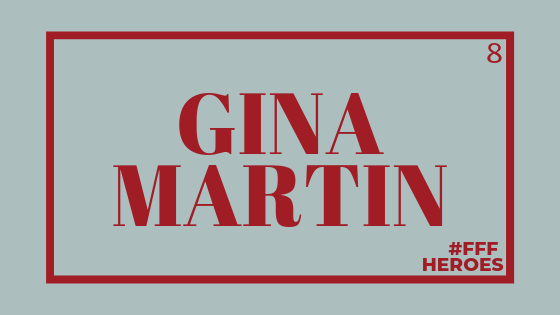 Why is Gina Martin important? I’ve written about this before, but one of the biggest issues around fighting discrimination is proving the case that a problem even exists. With only 15 out of 44 police forces even recording upskirting as a crime it’s clear that this wasn’t even seen in some areas as the problem it obviously was. Many of us accept our environment as it is – problems and all – and give up before we’ve even attempted to change things for the better. Martin recognised that if she didn’t make change happen then it might not happen at all. She was willing to go the distance. I’m highlighting her achievement here because she’s an excellent example for all of us. The fight might seem impossible at first, but break it into small steps, find people who will work with you and chip away at the problem until you’ve solved it. Find heroes, find role models and figure out what it is about them you admire – then find a way to follow in their footsteps, even if it’s just by doing something small. Read Caroline Criado Perez’s Invisible Women. It’s a phenomenal collection of the ways in which data isn’t collected about women meaning that the world is effectively designed for men. Pick one of the many, many, many issues highlighted in the book and start filling in the gaps in your own way. Find allies. One great place for that is the Women’s Equality Party. Membership starts at just £4.40 a month (or less for those on low incomes) and I’ve found them to be a brilliant, welcoming bunch. I’ve gone canvassing with the WEP once, joined their phone bank for an evening and joined their march at Pride in 2018 – they’ll gladly take as little or as much involvement as you can give. Go back through the rest of my #FeministFactFriday posts for more actions. The ones I’m listing here might not be your kind of thing, but I’ve made all kinds of recommendations (big and small) that mean you can make a contribution too if you want to.